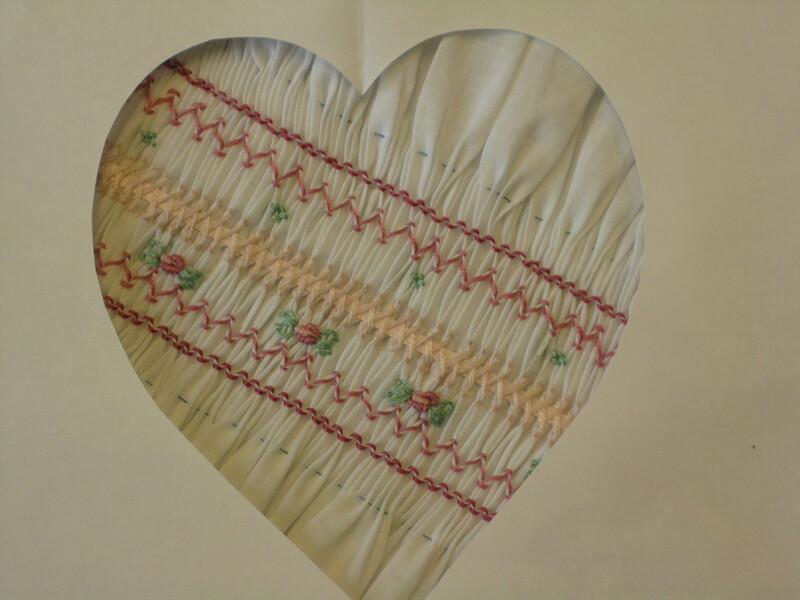 Question: Stephanie writes: Could you please explain the difference between regular smocking and English smocking? My mom loves to sew and I know she has done some smocking in the past but I don’t know what kind. I would like to impress her with my knowledge. 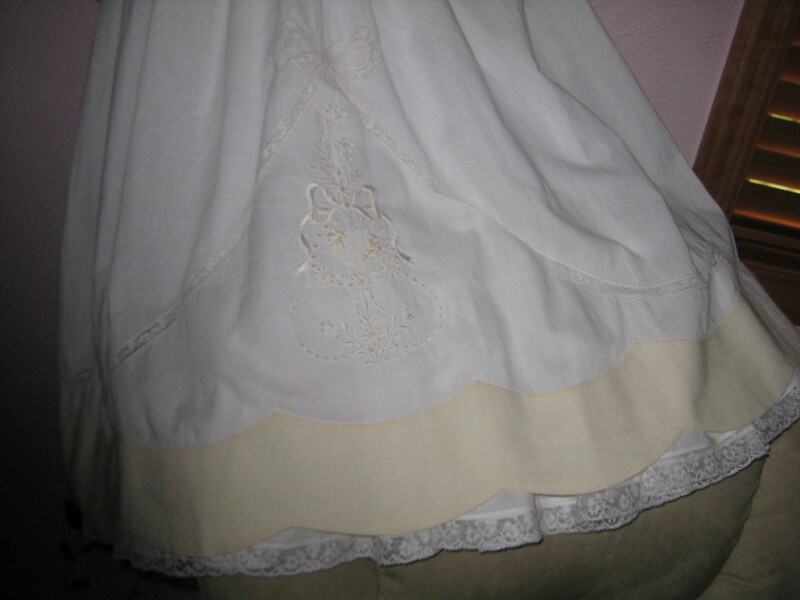 Answer: Smocking refers to the beautiful embroidery that is used to decorate as well as gather fabric. The difference between regular smocking and English smocking is the method used to create the gathers and the embroidery. Regular smocking is a one-step process: the embroidery stitches are worked over a grid of evenly spaced dots to create the gathers and the embroidery design at the same time. 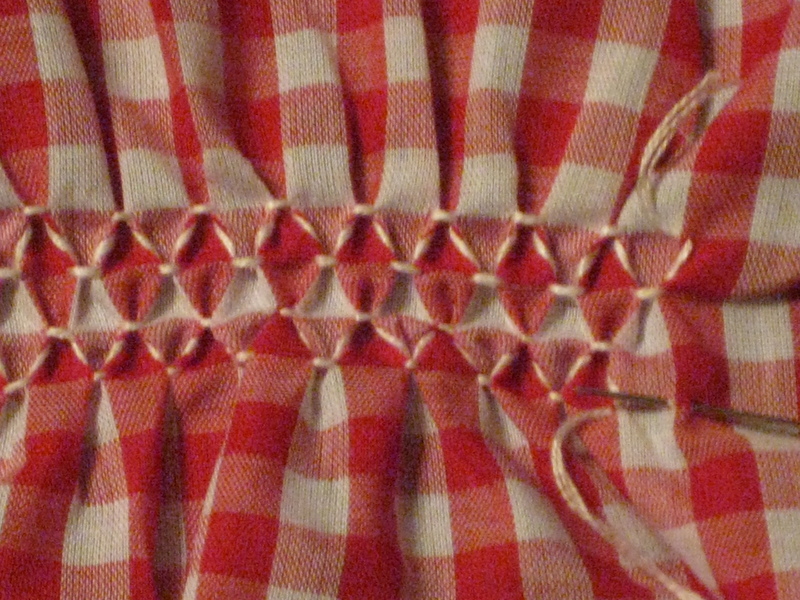 English smocking is the art of embellishing pre-gathered fabric with embroidery stitches on top of the gathered pleats. English smocking is a two-step process: first the fabric is gathered and then the embroidery stitches are worked over the pleats. For more detailed information, refer to my page “Stitching Tips and Tricks”. French Hand Sewing and Heirloom Sewing refer to the delicate stitching techniques of yesteryear where fine laces, entredeux, and high quality fabrics were combined to create beautiful clothing. Martha Pullen has brought these intricate hand stitching techniques to the sewing machine with breathtaking results. The wonderful sewing machines available today, coupled with fabulous feet and stitches, make heirloom machine sewing very exciting. 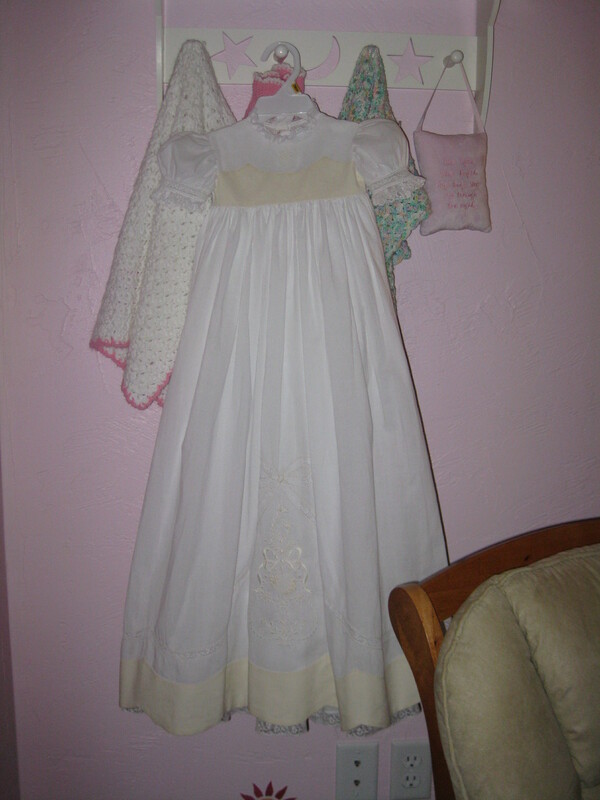 This christening gown is the one I made for my darling little granddaughter. She looked like an angel in it. Once a month I teach the Martha Pullen Gift of the Month demo class. Martha sends instructions for small projects using a different technique every month. Click on the Martha Pullen link to view her site and see the Gift of the Month projects. In addition to the Gift of the Month class, I also teach an Heirloom sewing class each month. Some months it is a notebook class where students learn the techniques and are provided information on how to use these techniques in their everyday sewing projects. Other months we stitch a project using the techniques that we have learned in previous classes. I teach at the Quilt and Sewing Center of Fredericksburg, Virginia. If you are interested in taking these classes, visit their website or call the store to register for the Martha Pullen classes. Aah! Lovely Tatting! Perhaps this is one of my favorite classes to teach. It is so simple and yet so cumbersome for the beginner to learn. It is unlike any of the needlework hand positions with which experienced needle artists are familiar. I was fortunate to live next door to my little grandmother while I was growing up. I was always fascinated watching her tat away with beautiful threads making lace edgings on everything. I was 8 years old when my older sister and I decided we wanted to learn to tat. Try as she did, grandma was unable to slow down enough to show us how to make the simple knot. The next day she brought us a book – “Learn How to Tat” – and told us to read the book and then come to her with any questions. My older sister carefully read the directions as I held the shuttle and did exactly what the instructions said to do. When I had the knot firmly in my head, I showed my sister and she, too, caught on quickly. One problem – we could only make the knots. We were unable to pull the thread, as the book had instructed, and make the pretty rings which are the trademark of traditional tatting. We ran next door to visit grandma. Now that we knew how to make the knots, grandma was able to show us how to flip the knot to the other side (sounds cryptic, doesn’t it) and then we were able to make those pretty rings. I was so fascinated with the entire process and the “magic” of slipping the knot to the other thread that tatting became one of my favorite things to do. 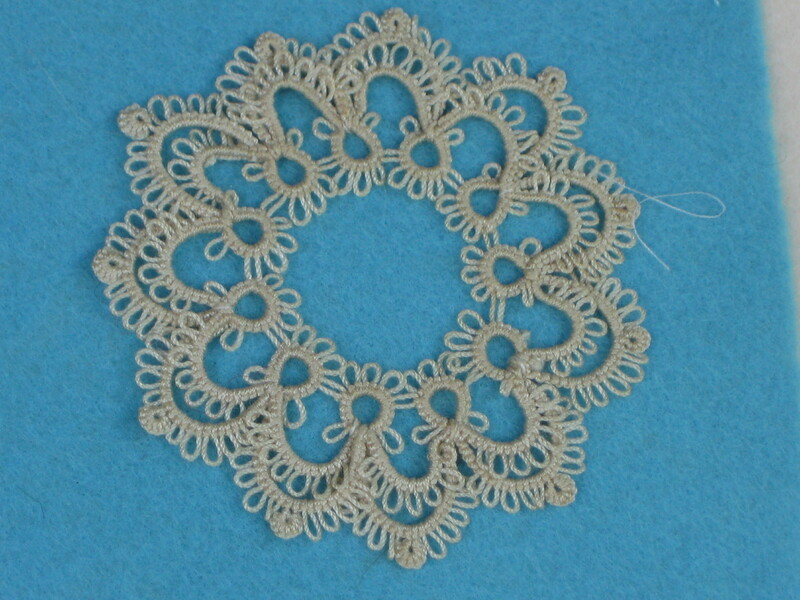 Growing up, I made tatting for some of the dresses I made – particularly lace around the collars. I never met anyone else who knew how to tat and the idea of teaching tatting never occurred to me. When I moved to Virginia, the first thing I did was look up the local needle arts store. As I was buying my pearle cotton thread, the owner of the little shop asked me what I was doing with it. I told her I used it in my tatting. She was so excited to have found someone who knew how to tat that she asked if I would be willing to teach tatting in her shop. Thus I began creating tatters in Fredericksburg, Virginia. I loved teaching the tatting classes. I often wonder how many of my former students are still tatting. 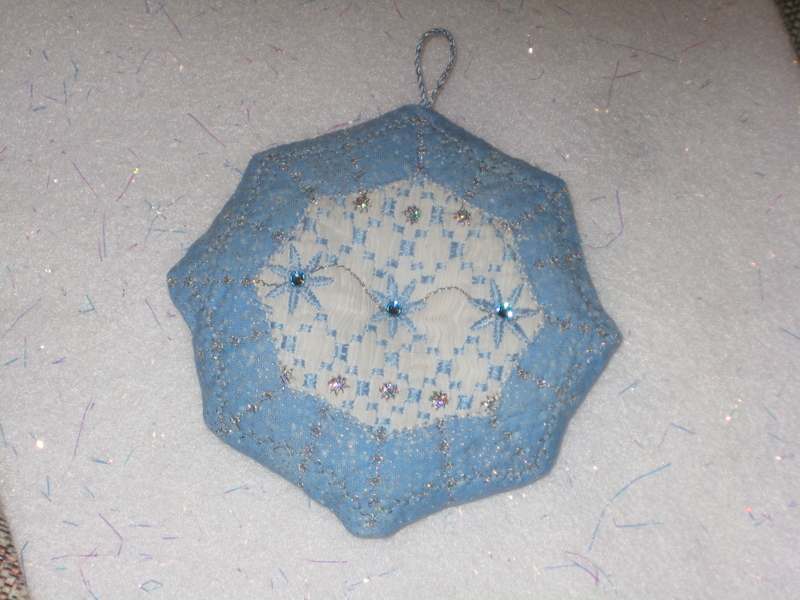 Now, decades later, I am still teaching tatting, but now I am teaching in a quilt and sewing shop. I have advanced my skills to new levels and am always excited to find something new about tatting. Wow! A few weeks ago I had the privilege of handling a century old christening gown. The gown design was all done in hand embroidered drawn thread work. It was absolutely lovely and the embroidery was impeccable. I was asked to recreate this gown – what an interesting challenge this will be. Drawn thread work is the art of withdrawing the weft threads from a piece of fabric and then doing embroidery over the remaining vertical warp threads. Beautiful lacey designs are created by the various ways in which the warp threads are manipulated with the hand embroidered stitches and needle weaving. 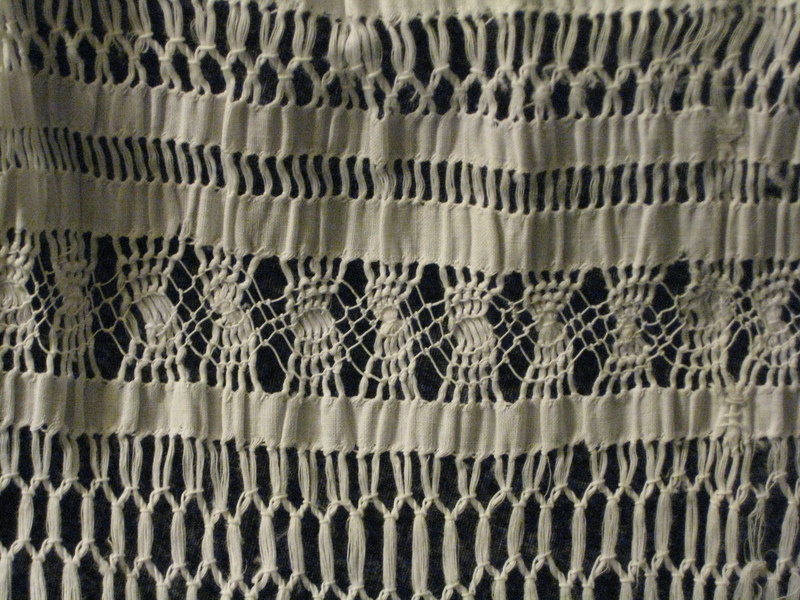 Traditionally this type of work was done on even weave fabrics such as linen. 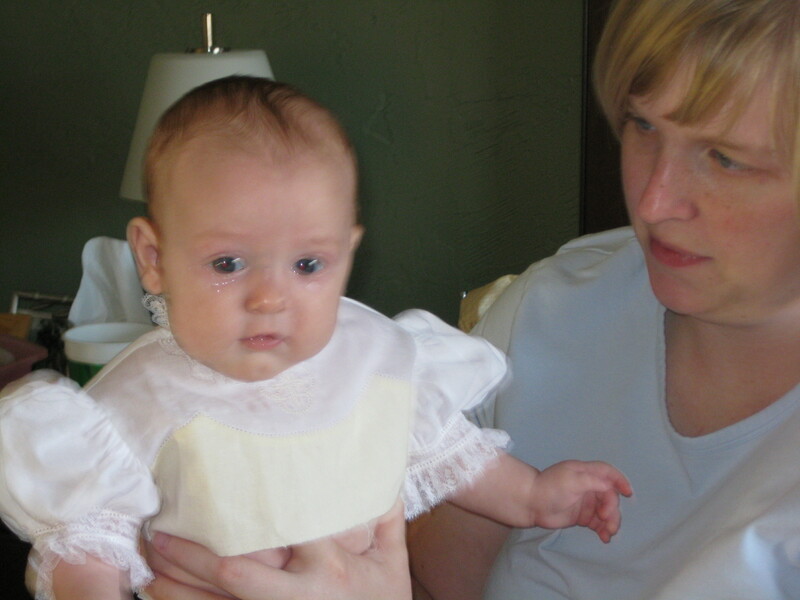 This christening gown appears to have been made of a linen batiste fabric. Currently I am searching for a fabric that will be supple and soft enough for a christening gown, the threads may be easily withdrawn, and the fabric will be strong enough to support the hand embroidery stitches. I have located several sources and samples are on the way. I’m keeping my fingers crossed that one of the samples will be exactly what I am searching for. Do you have a question or problem relating to sewing, lace making, or hand embroidery? Just Ask Rita will provide research and answers. No problem is too small or too large to tackle. Welcome to my world of stitching. Hopefully you will find some tips, tricks, and designs of interest and will visit often to see what’s new with Ritohn Enterprises. I’m an educator and would be happy to consider traveling to your area to teach my specialties. 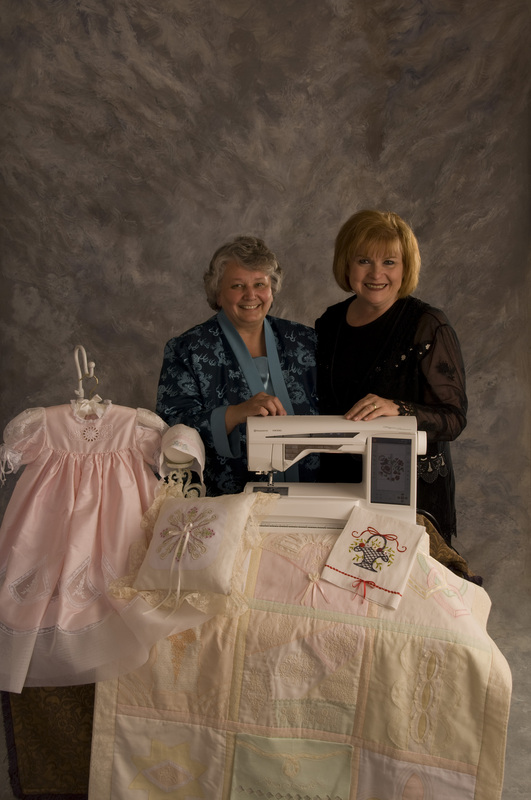 I have over 50 years of experience in the field of sewing, design, and needle arts. I love teaching and sharing the knowledge I have accumulated. While I do many things, my specialties are Heirloom sewing and lace making. I hold 2 Martha Pullen certifications (view the link to Martha Pullen’s site). If you have any sewing or needlework questions, just “Ask Rita” and I will be happy to answer your questions.